Collagen 360º Intensive Cream is an intensive action cream developed from enriched marine collagen, to combat the loss of collagen of the organism. Numerous cosmetic present collagen in its formula, since it helps the skin maintaining its firmness and elasticity but, differing from other products, Collagen 360º intensive cream incorporates this active ingredient in a high concentration. The enriched marine collagen improves the elasticity and softness of the skin. Of 100% marine origin, it presents a full compatibility with the skin cells and it is tolerated by all skin types. Due to its low molecular weight, it penetrates on the second layer of the epidermis to act where the skin needs. Used in conjunction with the other products of Collagen 360º line, the synergistic action 360° intensive Collagen cream reduces wrinkles, recovers the volume from the face and skin health. Collagen is the most abundant protein in the skin. Its function is to ensure the mechanical resistance and the firmness of the dermis. 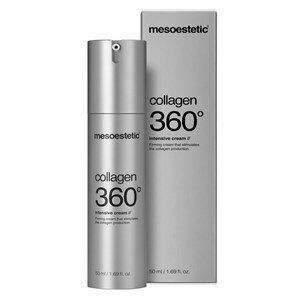 Collagen 360º products, are an innovation of Mesoestetic Cosmeceutical and were specifically created to reverse the loss of collagen that the body suffers and fight the signs of chronological aging. With a high concentration of enriched marine collagen, Collagen 360º stimulates cell renewal processes and reactivates the production of collagen and filler substances that give volume to the skin. Apply morning and evening on the face, neck and neckline with a gentle massage, until the total absorption of the product.